I’m taking a break from my daily Lenten reflections. 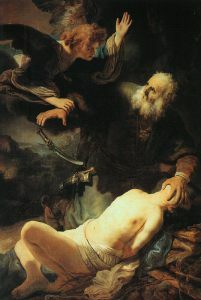 Today’s reading of Genesis 22:1-18 is the story of Abraham’s “sacrifice” of his son, Isaac. Instead of my own thoughts, I’m re-posting the blog that my friend Mike Mair posted on this passage a month ago. He uses a different translation of the Bible than what I use, but he has some excellent thoughts on this crucial story from Genesis. This blog has been following the book of Genesis and the Gospel of Mark since the new year. Previous posts can be found in my archives. that I will tell you of. and arose and went to the place that God has told him of. and saw the place from afar. Categories: Lenten Reflections | Permalink.